Last year I switched Chester and Gretel to grain-free kibble. I did a lot of research to find a food with high protein and fat because we were going to hike the second highest mountain peak in Washington state. They were going to need the muscle building protien and the fat energy source for the amount of training we were going to do. Life got in the way and we weren’t able to train last year. I still wanted to feed Chester and Gretel grain-free kibble but I started to be open to other options with lower protein, fat and calories. 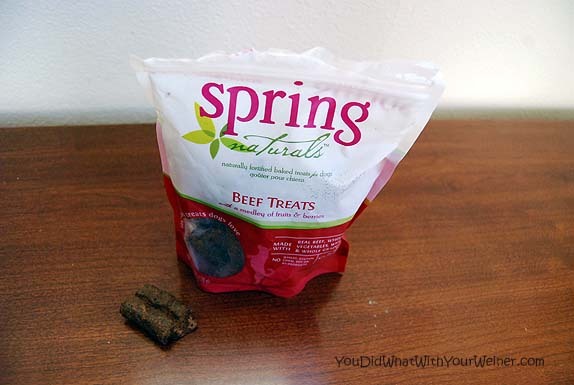 We got a chance to try the “new” (only a year old) Spring Naturals grain-free dog food. They generously sent us a bag of their Salmon Dinner (yes, in exchange for our review….but you know us – we wouldn’t fib and tell you you that we liked something if we really didn’t). I was up for giving it a try because I like their whole food nutrition philosophy – their commitment to use only real meat and whole fruits and vegetables sourced in the US. I also like that their factory is here instead of in some other country with different laws and regulations governing food manufacturing. After I got the bag of food in the mail, I did more research on the brand. 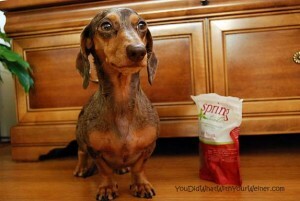 I think I would even be willing to try A Spring Naturals dog food WITH grain. My aversion to grain is mostly of the no-wheat-corn-soy-gluten- junk fillers type. Spring Naturals uses mostly quinoa and oats as their grain source. Heck, me and my grain-allergy prone friends eat that stuff! None of their food and treats contain wheat, gluten or soy which are the things most likely to cause reactions in sensitive dogs. So…did Chester and Gretel like it? They will scarf down anything they don’t dislike but they didn’t turn their noses up at this. I would say that they were happy to eat it. 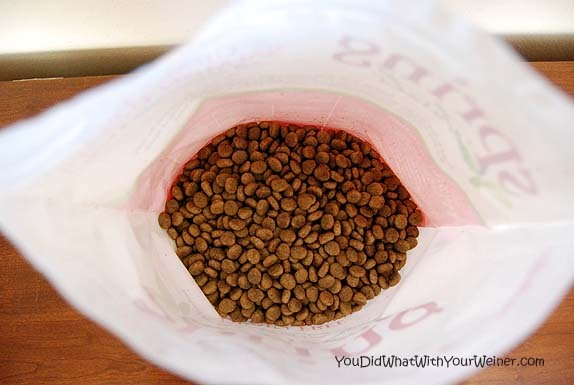 The size of the kibble was good – not too big and not too small for little Doxie mouths. We also got a surprise package of treats in the mail. They were not grain free but it’s the same deal as their food – quinoa and oats. The treats are a lot bigger than I normally give Chester and Gretel. Their thickness and rubbery texture make them impossible to break into small pieces unless you have super-human strength (or are maybe a guy). Chester and Gretel’s nutso reaction to them makes me consider buying more for special occasions though. I will have to think about it while they finish this bag. Spring Naturals gives back too. I am a little skeptical of this “giving back” thing lately. Brands know that us pet owners have bleeding hearts and gobble that stuff up. It seems that everyone is doing it these days and it makes me wonder how many of them do it for good PR and advertising and how many do it truelove out of the goodness of their hearts (oh, they certainly all CLAIM that). I guess in the end it doesn’t really matter to me as long as needy doggies are being helped. Since their marketplace debut last year (January of 2012), Spring Naturals has donated over $10,000 in product and monetary contributions to various animal welfare groups, shelters and rescues through multiple programs. That does seem more than just a token gesture. Spring Naturals cares about the health of pet owners too. Through January they are running a Fit with Fido campaign on their Facebook page. Every day they are posting a tip to inspire a healthier lifestyle with your pooch (we were asked to contribute and my tip will be posted on January 3oth). 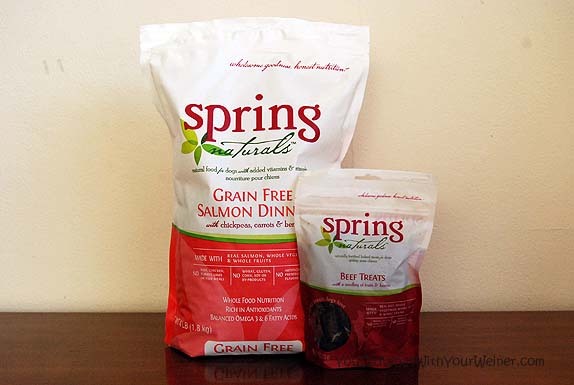 If you are considering switching to grain-free, or low-glycemic grain, dog food or just want to change things up I would take a look at the Spring Naturals line. This looks like a great food. I might look into it to have on hand in case of running out of raw in the fridge. Those treats look pretty tasty, too. I am happy with my current food, but those treats sound interesting! Love the looks of the treats. Have a wonderful Wednesday. Your fears about fishy food made me laugh. We actually feed almost exclusively fish due to my dog’s issues with red meat. I’ve never noticed a strong smell off the food or her. I haven’t heard of Spring Naturals before but they sound like a great brand and company. I am happy with what we are feeding now but if I feel like changing it up again in the future I’ll have to look for them. It’s great there is so much consciousness about health in pet food companies these days. It’s much easier than ever to find good, quality products.